Tea Ceremony Koto started the term of “Sakura tea ceremony” from March 21st after Hina doll’s festival term. A lot of foreign tourists will visit Kyoto Japan from the end of March to April. Not only foreign tourists, some Japanese family also come to my tea house to experience the authentic tea ceremony near Kinkakuji temple. This is made by Senbon Tamajuken I often buy for the classes of private tea ceremony. Today I had the private class for a Japanese man of around 50 years old who came from the east Japan. 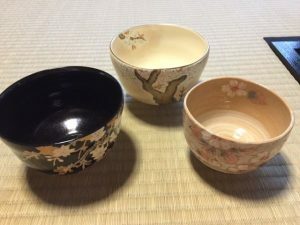 It was the first experience for him to join a tea ceremony. He also liked this beautiful fresh sweet. “I’ll come back someday after leaning tea ceremony more.” He said. 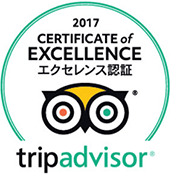 I was also happy to hear that he liked tea ceremony experience here. I’m looking forward to seeing him again someday, too. Keiou sakura starts blooming earlier than Someiyoshino, which are the most numerous cherry trees in Japan. We often use Keiou cherries for Japanese flower arrangements. I displayed Keiou Sakura in the formal way of Japanese flower arrangement. Its pale pink is modest and beautiful. It really shines in the bright blue vase in the tea room also. It seems like cherry blossoms are blooming beside the clear blue lake. I welcome one Japanese family with 2 little children 4 and 5 years old on the holiday around vernal equinox day. 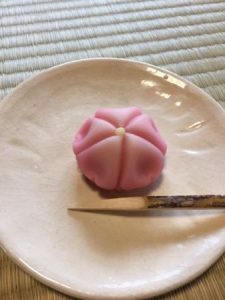 Under 6 years old children also are able to join tea ceremony in the private class here, so they can enjoy at their own pace. I was happy that small children also tried to learn tea ceremony and enjoyed the taste of the authentic thick tea as well as light tea! The last class starts from 16:45 every day. One day, UAE man came alone. Of course, Tea Ceremony KOTO sometimes accept big group around 15people if they come in the same tour group, but I think guests can feel much more authentic peaceful atmosphere if they come in the small group. The timing of bowing, taking the utensil or whisking powdered green tea during the way of tea..etc I think we can feel the authentic atmosphere from the detail movements or timing in the small room more than the wide room with a lot of people. In addition, I always try to explain the detail of the potteries or tea utensils with seasonal Japanese paintings one by one. Although some Japanese people think that it’s too difficult to inform changing seasons in Japan to foreign tourists, it’s very important point in the tea ceremony I believe. I feel happy when my customers feel deeper Japanese culture in the tea ceremony. I’ll continue to do my best!